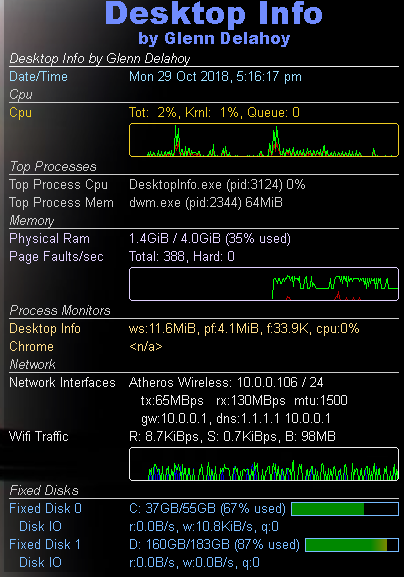 This little application displays system information on your desktop. Looks like wallpaper but stays resident in memory and updates in real time. Perfect for quick identification and walk-by monitoring of production or test server farms or any computer you’re responsible for. Uses very little memory and nearly zero cpu. Everything is customisable including language. You can leave bug reports and ideas in the discussion forum. If you have a translated language file you think could be useful to others, post it in the forum and I’ll include it in the next release. If you have any cool WMI queries that we can use post them on the forum. If you find Desktop Info a valuable tool, you can support it by making a donation. This will help keep the project alive and healthy. Donations of $100 or more will be acknowledged on the Special Donors page to be set up shortly and also in the manual. You can use PayPal, your debit or credit card.